Today we start our journey through the Ten Thousand Islands and Everglades National Park. This is all new territory for us as we have never cruised in these waters. 0930 finds us pushing away from the docks at Tarpon Point Marina. We enter the shallow waterway of the Caloosahatchee River just after low tide. Summertime, a Krogen Manatee, is just ahead of us and we follow them out of San Carols Bay and into the Gulf of Mexico. We are happy to find 1-2 foot seas. It has been blowing hard for the last few days and we weren’t sure how rough the Gulf would be. With an east wind coming off the land, we have a beautiful ride south to Marco Island, our stop for the evening. Just after passing Naples, we pick up Alizann on the AIS. They have been visiting friends there while waiting to rendezvous with us for a buddy boat trip through the Everglades and Keys. Reaching the entrance into Marco, Capri Pass, we find a tremendous amount of small boat traffic. It is a Saturday and we are violating our rule of not traveling on the weekend in order to take advantage of a good weather window. Luckily, the entrance is wide although it is very shallow. We timed our trip to arrive here at high tide. Depths are around nine feet. Our anchorage for the evening is in Smokehouse Bay. Getting in requires a two mile trip through the maze of narrow canals. The small boats are out in full force as we wind our way to the anchorage. 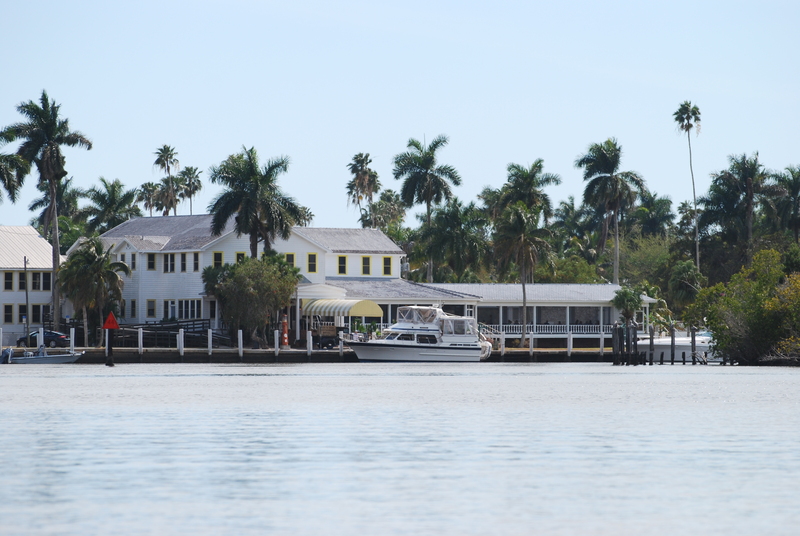 Smokehouse Bay is a small basin completely surrounded by homes, condos, and a marina. The anchorage is crowded with sailboats but we are able to find enough room for both boats. Summertime shows up an hour later and anchors between us. With three Krogens in the harbor, it is time for a mini rendezvous. The evening is spent aboard Alizann with old and new friends sharing stories and appetizers. Anchors are up at 7 AM this morning. 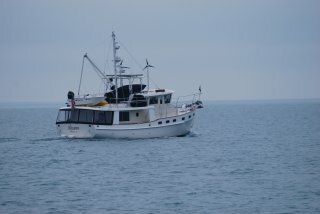 We don’t want to be going out the shallow channel at low tide which is at 9:30 today. Normally we would leave on a rising tide, but we also want to arrive at our next anchorage on a rising tide. This necessitates leaving on a falling tide at about one foot before low. Not our preferred time to leave but we don’t have much choice. The good thing about leaving this early is all the local boaters are still in bed. Alizann follows behind and we never see less than seven feet as we exit the inlet. 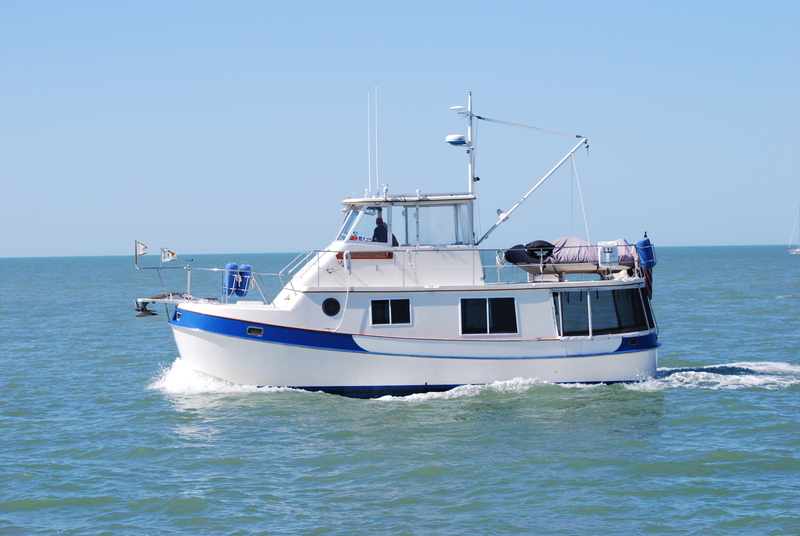 Today we travel about three miles offshore to avoid the Cape Romano Shoals. 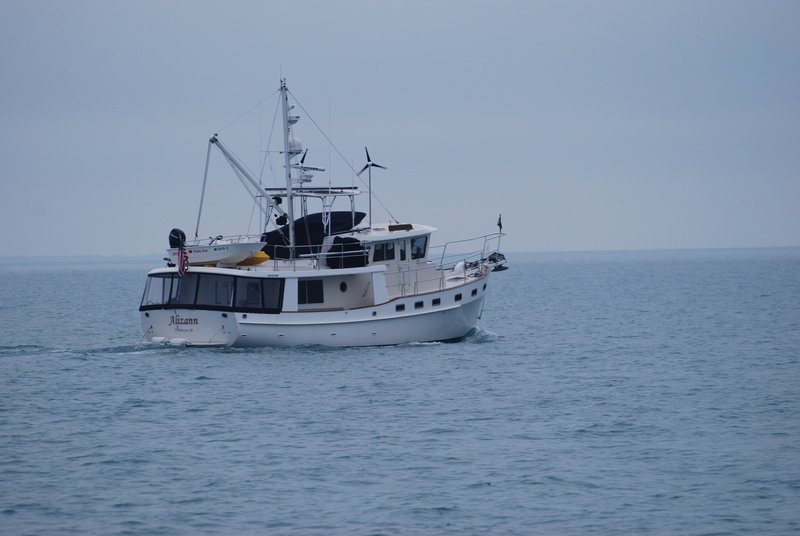 The seas are calm and it is another pleasant day on the water. Our only concern is dodging the many crab pots. Even 4 miles off shore, the Gulf is still shallow with only 18-22 ft. depths. 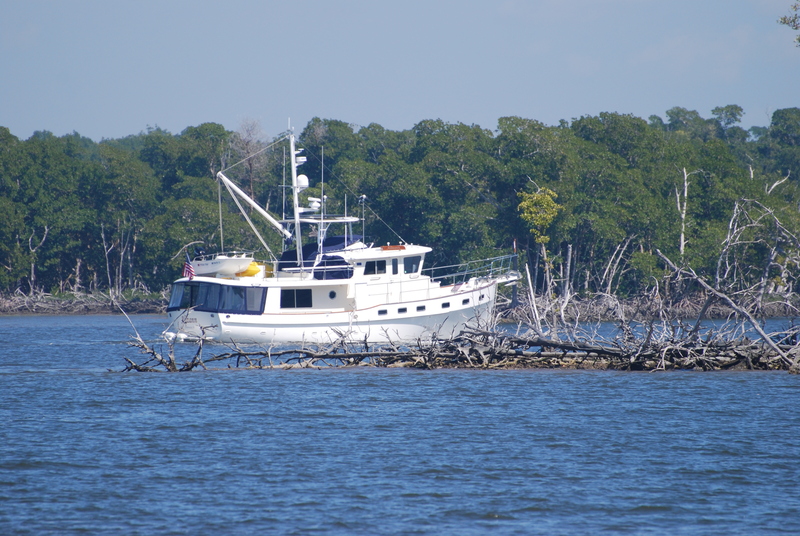 Our anchorage for the next few nights is in the Ten Thousand Islands. These primitive and remote islands form the coastline of the Everglades National Park and stretch for about 56 miles south of Cape Romano Shoals. 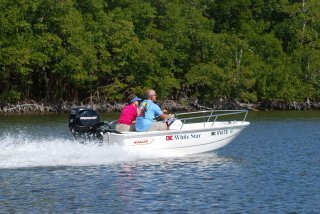 We enter the islands at Indian Key Pass and travel a few miles up the wide channel to Russell Pass. 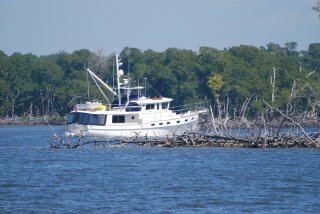 Here we find a nice deep 18 ft. spot between the small islands to drop anchor. Alizann settles in just beside us. The kayaks are down this afternoon for a two hour exploration through the mangroves. Winding through the narrow channels, we pay close attention to our route so as not to get lost. It would be easy to do in this dense maze of mangrove channels. The quite solitude of this area is delightful. 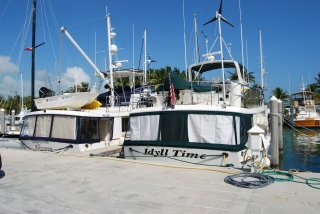 Dinner tonight with the Tucks aboard Idyll Time. Time Out and White Star, the tenders for Idyll Time and Alizann , were launched this morning for a five mile exploration to Everglades City. Sebastian is happy to see his life jacket come out as he knows this means he gets to go also. Following the well marked channel into the Barron River, we soon see the stately Rod and Gun Club just ahead. This historic hotel built in 1867 has been visited by well knowns such as Presidents Roosevelt, Truman, Eisenhower, and Nixon as well as Hollywood actors John Wayne, Burt Reynolds, Sally Field, and Sean Connery. Everglades City is a rural Florida outpost on the edge of the Everglades Swamp. This is the real old Florida. 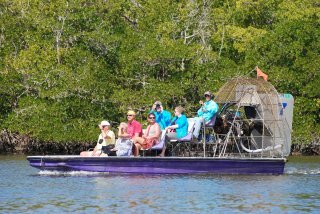 It is busy with tourists taking guided tours on the many airboats here in the river. We find a local seafood restaurant overlooking the water and enjoy some Grouper sandwiches while watching the airboats come and go. 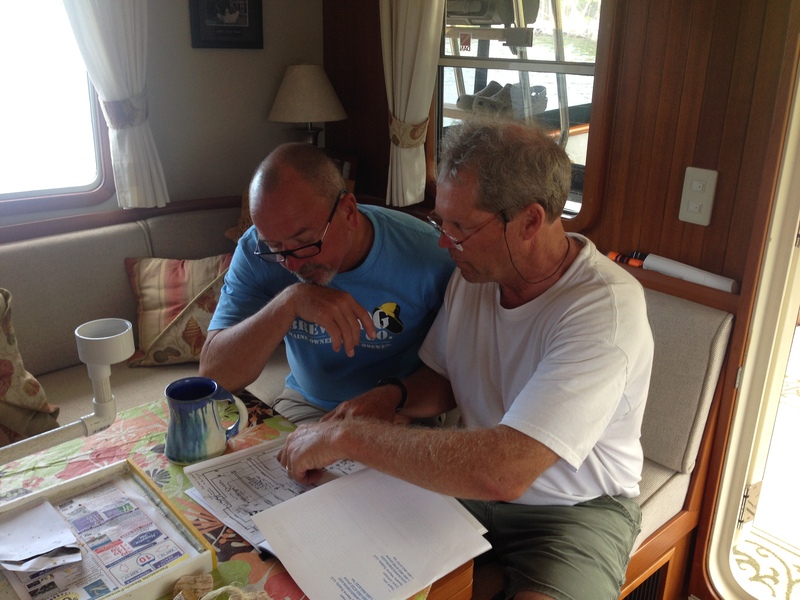 Our afternoon is spent back aboard studying charts and planning for the next few days. Jeff and Marty spend some time going over mechanical issues. It is scary how similar those two are. Our running joke is that they are ” brothers from a different mother”. They think just alike! Anchors were up this morning at 0700 in order to exit the anchorage before low tide. 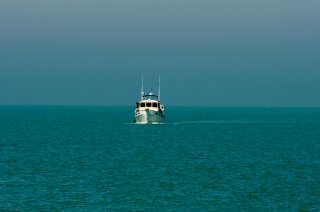 Alizann leads the way as we leave the shallow passage and return to the turquoise waters of the Gulf. 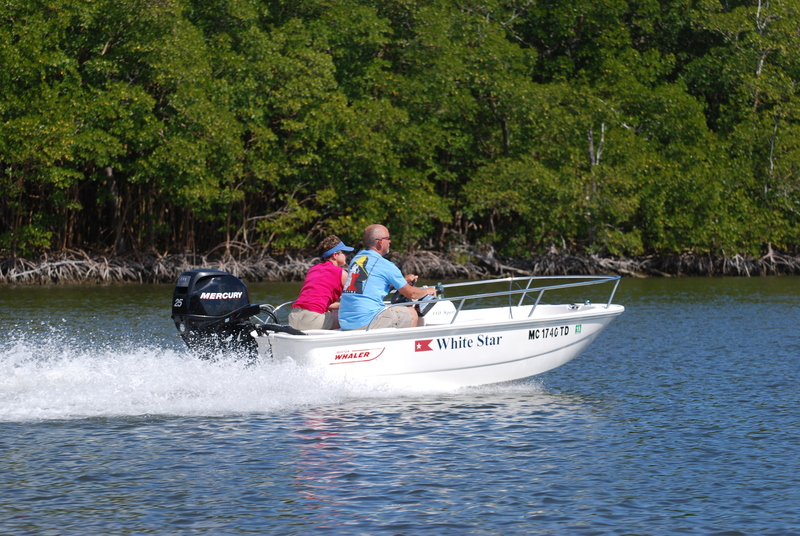 We are greeted with another beautiful day on the water with seas less than one foot. Our only concern is again dodging the many crab traps. With the generator running to charge the batteries, we use this opportunity to also make some fresh water with our water-maker. Nate seems to especially enjoy travel days as he gets to join us in the pilot house for some quality time together. It doesn’t get much better than this. 1:00 PM finds us at the entrance to Little Shark River which will be our anchorage for the next few nights. The scenery changes dramatically with with tall windswept trees lining the shoreline. Once inside the river, we have dense mangrove swamps on both sides. Our clear turquoise blue water has been replaced with a tea color brown. We travel up the river about a mile before dropping anchor. For now we have this area all to ourselves as there are no other boats here. A multitude of sailboats join us at anchor this evening. The river goes for miles with 10 ft. depths right up to the shoreline. 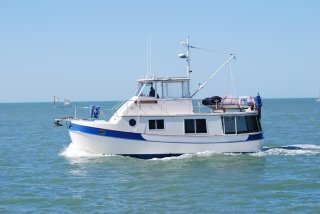 It would be easy to fit in 100 or more boats and still have plenty of solitude. Exploration of Little Shark River is undertaken in the dinghies not the kayaks due to the 2 knot current. Plus there are reported to be lots of sharks and alligators in the river. You could spend days traveling the maze of waterways. 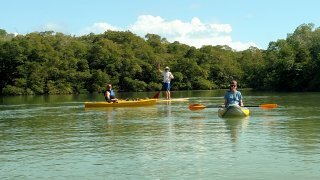 We enjoy several hours of exploration poking our noses up into the dense mangroves but never see the first gator, shark, or manatee. We do see some humongous sea turtles and a few dolphins. We try our luck at fishing which is also reported to be good here but never have the first bite. Each evening finds us sharing a meal with Marty and Suzanne alternating between the two boats. We always enjoy our time together. Owning identical boats, there is always some boat project or problem to be discussed. Being in the Everglades there is no lack of Mosquitos or no-see-ums. Each evening around sunset they come out in full force necessitating closing all portholes and hatches. They are hungry and brutal. Anchors are up at 6:30 AM prompt for our run to Marathon. The winds are forecast to blow 15-20 MPH today so we would like to get off the water early. The forecast calls for seas to build to 3-4 foot this afternoon. Once back out in the Gulf we are happy to find the seas 1-2 feet, much calmer than we had anticipated. We have crab traps everywhere so one of us is always scanning the horizon for these lurking dangers. While at Little Shark River, we had no cell or internet coverage with the outside world. Our phone service returns 5 miles off shore. It feels good to once again be connected with the outside world. 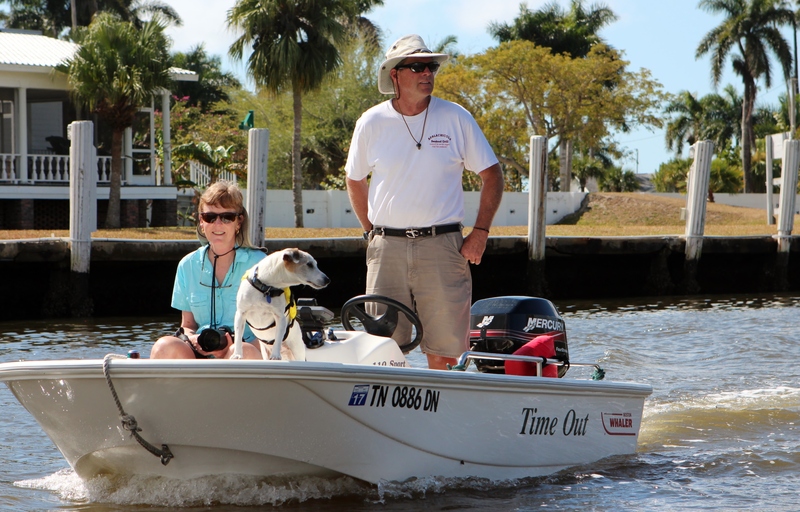 Suzanne and I both start our futile search for marinas in Marathon. We have heard that dockage is hard to come by and we are worried about finding a place to stay as the winds are forecasted to blow hard for the next week. Marathon is the mecca for boaters in south Florida. This time of year it is jam packed with vessels from all over the world and space is at a premium. The odds are a million to one that we will find a berth for both boats. Our other option is to go onto a mooring ball. 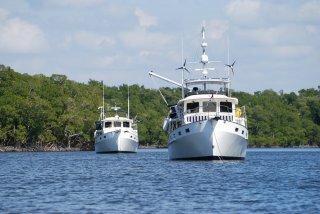 Marathon’s mooring field is one of the largest in Florida with over 220 moorings. However, only 15 of these moorings will accommodate boats 45 foot and over, and they are first come first serve. Suzanne made a call to the City Marina and is disappointed to find all the moorings have been taken and there is now a waiting list. We must go to the City Marina in person to be put on this waiting list but with the high wind forecast, the marina did not think anyone would be leaving soon. It looks like our only option will be to anchor on the outside of Boot Key Harbor. Here there is little protection in anything other than an east wind and we will be at the mercy of Mother Nature. I make one last phone call to Poncho’s Fuel Dock in search of a home for the night. The Cuban lady who answers the phone can barely speak English but I am finally able to communicate our request for two dock spaces and she says she will go ask her boss and call me back. I am surprised when she calls me back a few minutes later and says she has two slips available right next to each other. We are equally amazed at the extremely low slip fee that she quotes us. After a quick phone call to Alizann, we confirm our reservations at Ponchos. This is too good to be true!! 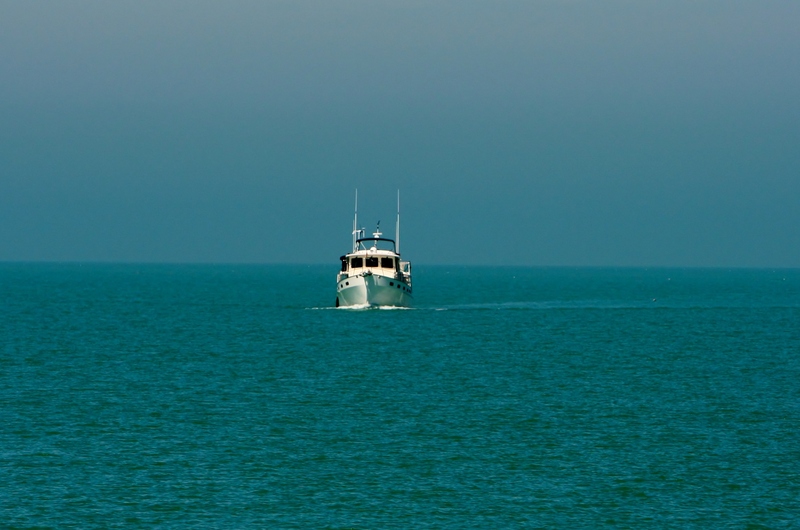 Just after passing under the Seven Mile Bridge, we spot the channel markers leading into Boot Key Harbor. Alizann leads the way and soon makes her turn into the fairway of Ponchos. Oh my gosh, I can’t believe my eyes when we arrive and see where Alizann is going. The fairway is only a few feet wider than our boats with berthed vessels crowding both sides of the fairway. We hold our breath as Alizann turns to back into the narrow slip. Fitting boats our size into these small spaces looks impossible. Alizann has only inches on both the bow and stern from two sailboats as she negotiates into the tight space. Boat owners have now popped up in their cockpits as they saw our massive hulls approaching. They are worried that we are going to crash into them. Alizann smoothly maneuvers into the slip without touching a thing. Now it is our turn. Alizann fit so surely we can also. With me on the bow and Suzanne calling out feet on our stern, Jeff somehow manages to get us into the slip without damage. With the bow of our two boats taking up half of the fairway no other boats will be coming or going while we are here. Our crowd of onlookers give the two boats a round of applause as they can’t believe their eyes. Suzanne and I just look at each other and shake our heads. We have been in some tight spaces before but this has to be one for the record books. This entry was posted on March 8, 2015 at 3:47 pm. You can follow any responses to this entry through the RSS 2.0 feed. You can leave a response, or trackback from your own site.